He’s not Cash. But he’s doing a fine job of keeping my present tense reminded of why Cash was so special and will never be forgotten, in a way that is no longer so filled with tears but, once again, with joy. A fine job indeed. Thank you God, and Cash, for sending him. Kathleen named him Ezekiel. Ezekiel was a major prophet in the Old Testament delivering this message from God: I will give you a new heart and put a new spirit in you. Seemed appropriate. We call him Zeke. And he’s a joy. When Zeke came into our lives, as terrific as he was, he had a lot of issues, especially around feeding time. He’s had seven owners during his seven years of life. 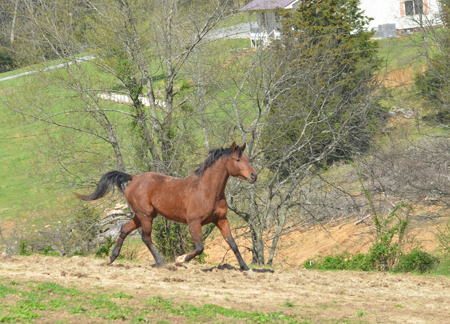 And the one three months before we found him had completely abandoned him and several other horses when his show barn had gone into bankruptcy. The owners just walked away. The horses didn’t have enough to eat and grew very thin. Aubree Becker, from whom we acquired Zeke, guessed that he was probably 400 pounds underweight the first time she saw him. 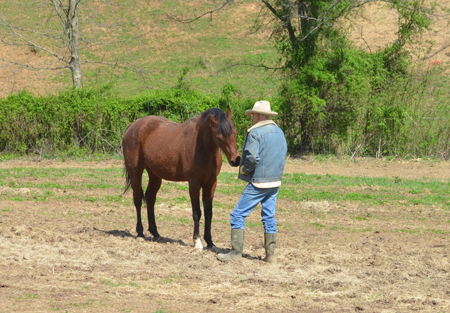 She worked him up to maybe 200 pounds underweight when he came home with us and within a few months was back to normal. He ate like there was no tomorrow. Ate fast like the food might disappear any minute if he didn’t finish it. We knew that it was going to take a while for him to trust the notion that here at his new home he would always have enough to eat, of all the right stuff. And that grass or grass hay would be available around the clock, 24/7/365. And at feeding times nobody was going to mess with his portions. He had to learn how to trust, perhaps for the first time in his life. One evening I was standing in the tack room doorway talking with Kathleen who was inside. Zeke walked up behind me, poked his head across my shoulder, and blew in my nose. I turned and blew lightly back, scratched him on the cheek, and continued talking. We have a tradition at the evening feed. 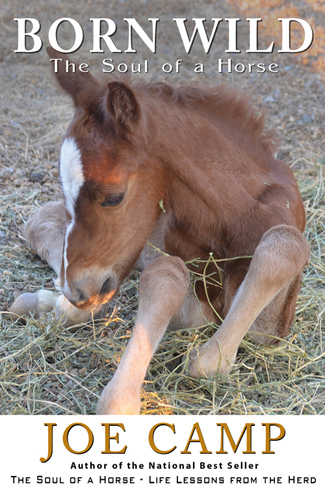 After each horse finishes his or her meal they get a handful of alfalfa. Dessert, if you will. It all started with No Agenda Times. 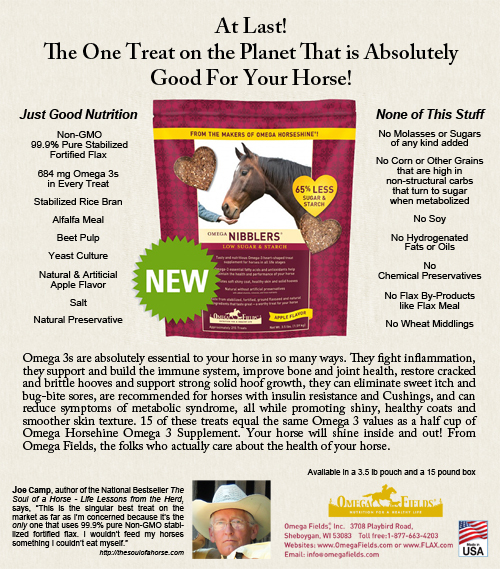 Horses love alfalfa so we use it during No Agenda Times to help them overcome their fears and see, on their own, that there was no reason for the fear in the first place. 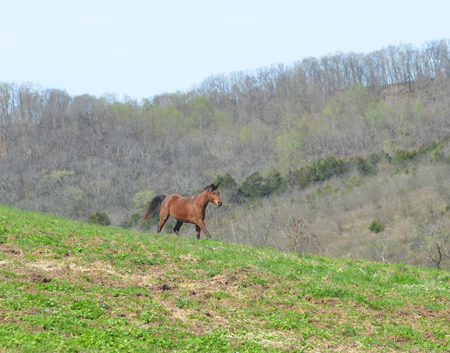 Like Saffron when she first came to us, fresh from the wild and pregnant. We would scatter a bit of alfalfa right around our feet and even sometimes between our chairs. Saffron wouldn’t allow either of us to touch her. We couldn’t even stand up or she’d be gone. But she would munch alfalfa mere inches away while we talked about the day and completely ignored her. Made no effort whatsoever to touch her. It took 35 such evenings before a switch clicked and suddenly she was all in. From zero to a hundred in a nano-second. You can read about it in Born Wild, or No Agenda Time, or Mind Boggling This Relationship. It wasn’t long before we began to feel guilty about the other horses peering into the paddock and seeing Saffron munching alfalfa. So, you guessed it, we finally gave in and began to give a little to everybody after they finish their dinner. It’s been a delight to watch Zeke’s transition begin to settle in. But in the beginning he got used to his dessert of alfalfa flying in immediately after he finished his dinner. Immediately! He would huff and puff and shake his head and stomp his feet. Nothing really aggressive, but you couldn’t help but believe that he wanted you to think it was. But that wasn’t the case. It was fear that maybe the alfalfa wasn’t coming at all. Trust was unknown to him. I had already learned about a lot of bad stuff in his past and after observing him and interacting with him for a while I actually became amazed that he was, overall, still as good and well-behaved a boy as he was. 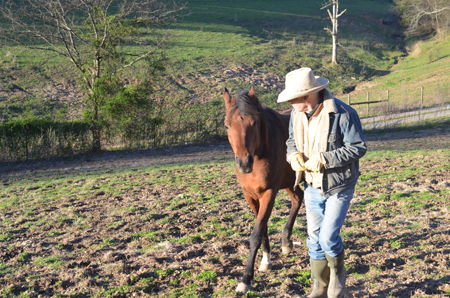 One of the first things I do with a new horse is teach him to back up, or if he knows already, I teach him how we do it. Who moves who in a herd is the determining factor of who is dominant over who. Who is the leader and who is the follower. So I want to be able to back a horse, willingly, half way to Nashville if necessary to remind him or her that I am the one doing the moving. Just a safety precaution on my part that I hope I never seriously need but, just in case, it is a completely non-hostile reminder of who the leader is. 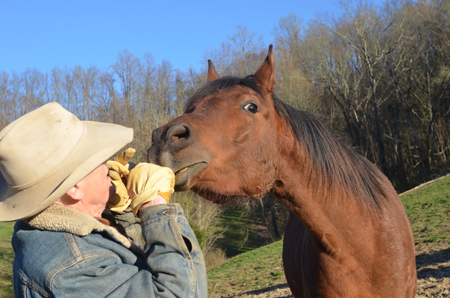 Remember, we live and work with our horses totally at liberty. Which is a tonic for trust. Both ways. But when I started asking Zeke to back up he would toss his head and stomp, sort of prancing, backward, even rearing a bit. He would back up, but there was a lot going on inside. My first reaction was holy moly (or worse :) what is wrong with him?! And Kathleen didn’t want to get near him. But then I began to actually watch him closely and I began to visualize exactly what I bet was going on. 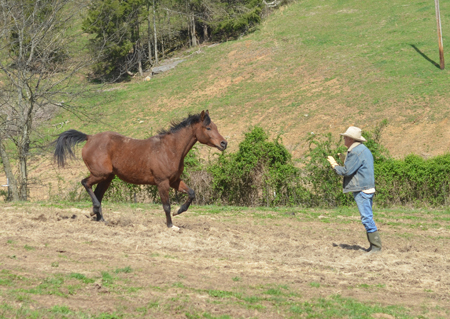 Some trainers teach back up by shaking the lead rope. Their instruction is to shake it as lightly as possible but shake it as hard as necessary to get the horse to take a step backward. Then stop and praise… and do it again. Over and over. That brass halter clip on the end of a lead rope can be pretty heavy. And a hard whip-lashing shake of the rope could be popping the horse in the jaw with the clip. To which he or she is going to react… exactly like Zeke was reacting. We, of course, had no lead rope. And I wasn’t swinging my arm, just sort of flicking my fingers toward his chest. But I was speaking pretty loudly since it was an initial effort. Like speaking to someone who doesn’t understand our language so we speak louder. When they still don’t understand, we speak even louder. The concept makes no sense, but I’ve done it. I suspect we all have :). So I reversed myself, pushing all adrenaline down into my toes, and whispered the words “back up,” barely flicking my fingers toward his chest. “Go on, back up. Easy.” He took a very quiet step back. “One more,” I whispered, with another little flick of the fingers. And he took another step quietly backward. “Such a good boy!” I said. And gave him a treat to confirm his understanding that this is exactly what I was asking for. It’s been such a delight to watch his eyes and face and ears as the realization begins to sink in that this is a totally new experience, unlike any he’s had before; as he lets his fear dissipate and trust creep into his being. By the way, the method I used to teach Saffron to back up, at liberty, was quite simple and much more effective than any rope has ever been. I simply pushed my thumb into her chest saying back up until it became annoying enough to cause her to take a step backward to relieve the pressure. At which time I’d praise her and give her a treat. It took ten or fifteen minutes tops for her to have it down pat. A solid back up. But back to Zeke. He is teaching both Kathleen and me everyday to listen to him. To take the adrenaline out of the experience and feel a deep breath settling over it all. No agenda-driven have-to-get-this-done-today experiences. Some days at feeding times we just hang out. Me fixing the buckets. Zeke munching hay undisturbed. Zeke eats each meal in the breezeway of the barn, where Cash used to eat. I open the door to the hay room and he’s welcome to munch any Bermuda he can reach while I’m in the tack room loading buckets with Triple Crown Chopped Forage (a forage in a bag we call chopped salad), California Trace (in the mornings; a supplement), Omega Fields Horseshine, and diatomaceous earth in varying quantities for parasites. I’m in and out and back and forth a lot, always giving Zeke a rub when passing close enough. In the beginning he would come up shaking his head, wanting to get pushy asking for a treat. And every time he did that, I would bring my adrenaline down, which would bring his adrenaline down, talk softly, barely gesturing, and I would teach him something brand new that would get him a treat. It didn’t take long for him to realize that treats came as a reward for smiling, giving kisses, flexing to one side or the “other”, making a bow, waving hello with his foot, or his “other” foot, or backing up calmly… and that anytime he asked for a treat without doing something for it he’d get to learn something new. The asking stopped. Except every once in a while he’ll walk up and wave hello or flex or smile or all of the above. And if he’s sweet enough about it, he’ll usually get one. But for the most part he never asks anymore. Just like he never comes up huffy and puffy demanding his alfalfa anymore. He just lets us know that he has finished his meal, in a very quiet and calm way. And I know exactly what he’s doing. And I listen. Sometimes it’s easy to forget things like how long Cash and I were together and how much time I spent with him. 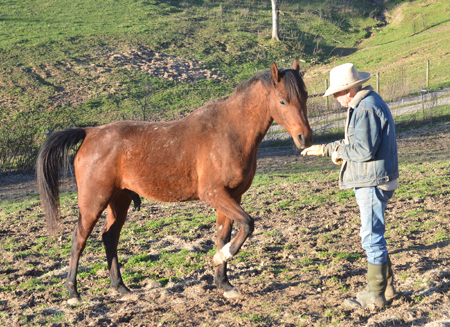 How long it took for mustang Saffron to become the sweetest horse in the entire world. But Zeke has reminded me. He walks with me from any point to any other point. And he comes to a call. If he can hear me. 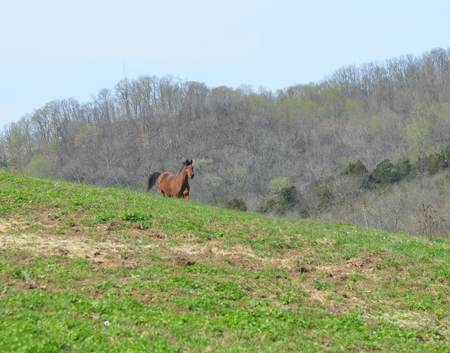 Yesterday morning five of the horses were within earshot and could see me waving them down the hill. They came. But Zeke and his two mustang friends Saffron and Noelle were apparently over the ridge and the wind was coming from that direction so I want to believe he couldn’t hear me call. Finally I walked up and over the ridge and there they were, still a good ways away, but when I called his name Zeke looked up immediately and came running. 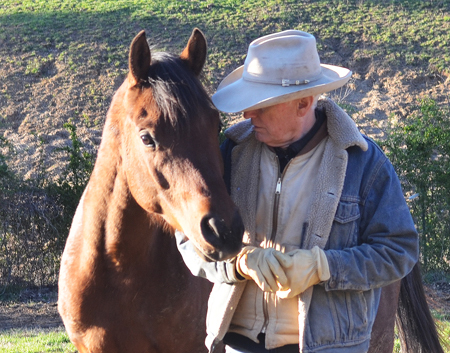 This is my response to him: Thank you for the kind words about the blog… but I don’t really think “meeting halfway” is the key to relationship with a horse. With Zeke the burden was mostly on me… to evaluate his issues and reactions and then lead him out of them into a new life. Notice I said “lead”… not force, not cajole, not create a conclusion that I, the human, want… but to let him see and understand that there is no longer any cause for him to fear, and to understand what that can mean to him, which of course is trust. An absence of fear. I could lead him through that, and demonstrate, but I had to let him make the choices. 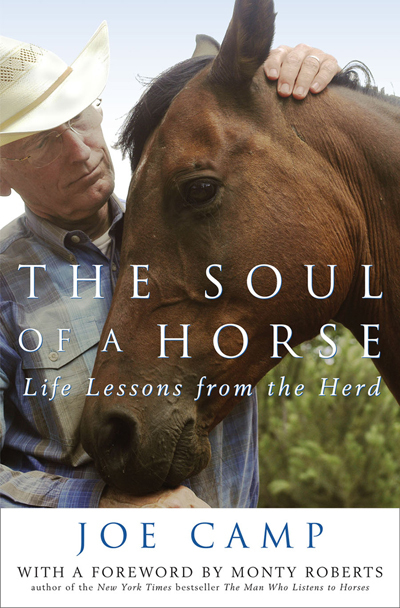 I learned that in the very beginning with my first horse and Monty Roberts Join Up. 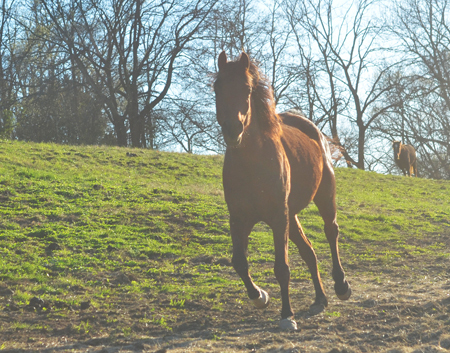 The most important element in the process is leaving the choice to the horse. I must convince him that there’s no reason to fear. And therefore there is reason to trust. That nothing bad is going to come from all this. Again, in Zeke’s case, possibly for the very first time in his life. But when you start with relationship first because you care about this horse and this relationship, and you allow him to prove to himself that he can trust you, that you are worthy of his trust, and he chooses, of his own free will, to trust you, then everything changes. Everything. You will then have a willing partner who will never stop trying for you. I didn’t train Zeke to come to me when I call his name. As the trust evolved and the fear dissipated, that’s something he chose to do on his own. Which is a pretty strong testimony for what trust can do, seeing as how, at this writing, we’ve only been at this a few months. And usually he comes running. Which frankly in the wet weather we’ve been having I would prefer he not do. But he insists. Suffice to say, it’s been a joy learning from Zeke, allowing him to take me back to the beginning, watching the trust emerge, allowing the trust to emerge, and watching the adrenaline drop. Learning how very very bright he is. And how quickly he gets things. He’s not Cash, of course. There are a lot of reminders, but he’s not Cash. He’s Zeke. I still think of Cash all the time, but Zeke is making it so much easier. So many fewer tears. So many more smiles about the good times. And the good times to come. “You’re grinning out loud,” says Kathleen.